Don't hesitate roping pearls together. In fact, some outfits need that extra pizzazz to make a sassy fashion statement. As an avid antique ring collector -- a theme which acts as a metaphor for various relationships in my memoir -- I immediately accepted the invitation to preview the 40 plus rings assembled together for the first time for public view and sale at Les Enluminures' New York gallery. There is so much pressure to choose the "right" ring that couples can lose sight of the original purpose: as a symbol of love and commitment. 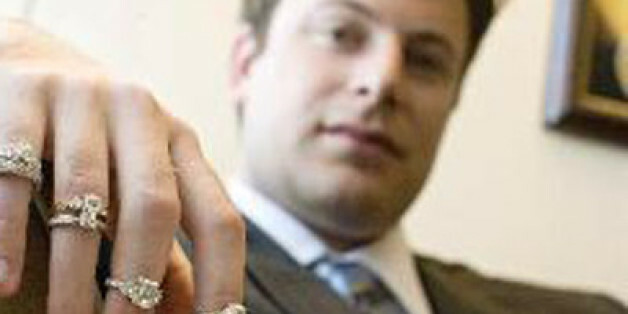 Are 'Man-Gagement' Rings The Next Big Thing? Joshua Opperman, Founder and CEO of I Do Now I Don't, joins Nancy to talk about how he came up with the idea to create a business for used engagement rings. For decades, brides have been asking themselves this question: when I go to buy my wedding dress, why do sales attendants try to decorate me? 12 Glittery Little Somethings To Make Your Wedding SPARKLE! If you're feeling stumped on what style suits you best, let your face shape be your guide. Here are tips to help find your signature style and stop splurging on expensive jewels that just don't work! If the dress makes the wedding, then I say the jewelry makes the dress. With so much on the line, brides, wanting luck in love and life, have thoughtfully mapped out what they'll wear or carry with them down the aisle. Each item in the poem is thought to bring the bride luck on her wedding day. The "something blue" in the poem is a custom that began in Ancient Israel when brides would wear a blue ribbon in their hair or on the edge of their dresses to symbolize loyalty. All judging aside about whether or not Courtney was the right choice (we'll leave that job to Ellen), lets have a look at the Neil Lane-designed engagement ring that Ben Flajnik proposed with on Monday night's show. What should you think about when designing a custom piece? Here's my best advice.